1.Prepare Honey-Lime Sauce: In small bowl, whisk together garlic, lime juice, honey, soy sauce and ginger; whisking constantly, drizzle in oil until emulsified. 2.Prepare outdoor grill for direct grilling over medium heat. Place shrimp in large zip-top plastic bag; pour half the sauce over shrimp. Seal bag, pressing out excess air; let stand 20 minutes. Soak skewers in water 20 minutes. 3.Prepare Bowl Fillings: Prepare rice as label directs. Coat jicama, mango, bell pepper, pineapple and onions with oil. Remove shrimp from sauce; discard sauce. Thread shrimp onto skewers; sprinkle with salt and pepper. 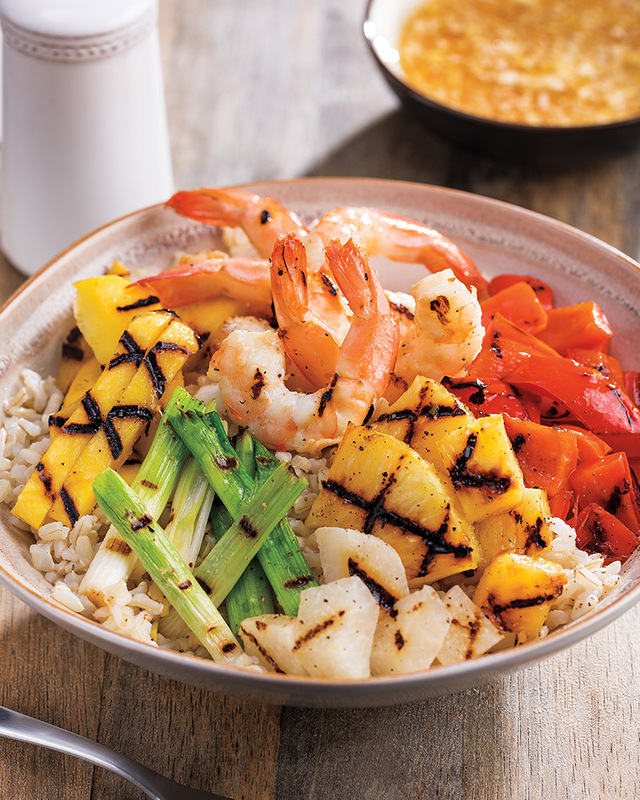 4.Place shrimp skewers, vegetables and fruit onto hot grill rack; cover and cook 5 minutes or until shrimp turn opaque throughout and grill marks appear on vegetables and fruit, turning once. 5.Cut bell pepper, jicama and mango into 1/4-inch-thick slices; dice pineapple and cut onions into 1-inch pieces. Evenly divide rice into 4 bowls. Evenly top rice with shrimp, fruits and vegetables; drizzle with remaining sauce. > Don’t let the jicama in this recipe intimidate you. A jicama, or Mexican potato, is a juicy, sweet tuber with a savory apple flavor and a distinct crunch. Use a chef’s knife to peel the thick, papery skin. After peeling vertically, cut into produce sticks for snacking, shave thin slices on a mandolin to top off a salad or dice and add to salsa or stir-fries.